"What's a Chrome profile?" you might ask. Just best solution ever for switching between multiple Google-based email accounts! Consider this fairly common situation: you're a teacher at work. 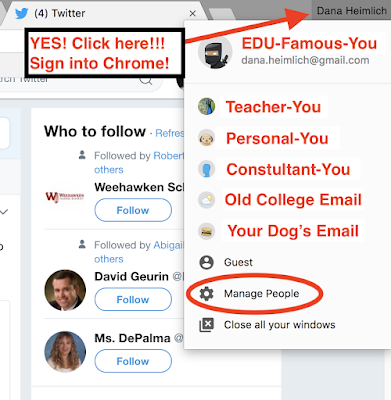 You are signed into yourworkemail@school.edu, a G Suite for Education account. While you're "here", you probably want to see teacher-related bookmarks and use teacher-centric extensions and apps. 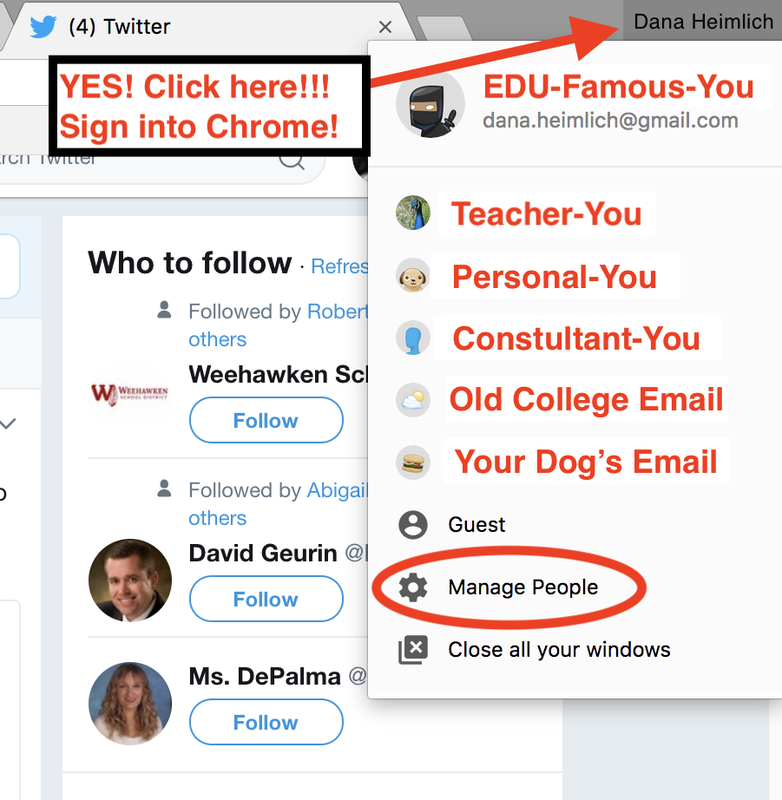 Teacher-You wants to access your Teacher-Drive files and folders, your Teacher-Calendar, Google Classroom and maybe even a Teacher-YouTube channel and Teacher-Twitter feed--all of these things being linked to yourworkemail@school.edu. But now you're on lunch and you're desperate to watch those adorable puppy videos your friend sent you yesterday--to your personal Gmail account. DON'T DO THIS. STOP DOING THIS. THIS IS A TERRIBLE THING TO DO. 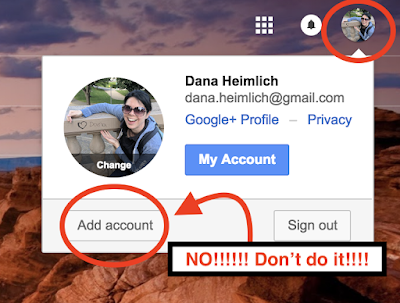 This will open your personal Gmail account in a separate tab right next to your work account, which will temporarily make you happy. But it will also semi-permanently cause Google Chrome to have an identity crisis and constantly wonder if Teacher-You or Personal-You is trying to use Drive, Calendar, Classroom or YouTube from that point forward. Have you ever called tech support complaining that you suddenly didn't have access to some Google Doc you used to co-edit? Or wondering why you appear to have instantly lost all your student folders in Google Drive? Only to find out that... you were accidentally signed into your personal Gmail account and that was the problem? I know because I have been on the receiving end of that phone call or ticket request too many times to count. And it still baffles me that Chrome profiles aren't way more popular as a result! So let me tell you what you REALLY want to do when you want to open a cute puppy video on your lunch period. You want to create a Chrome profile for each of your various... "selves". You want a profile for Teacher-You and a profile for Personal-You. The You who's actively using Chrome appears at the top with the email address displayed under your customized username. Other profiles or "selves" appear below it, as well as a Guest option and a settings cogwheel. Your display will probably be much simpler than mine since I have six Gmail accounts and you more likely have... two. Max, three. But you get the idea. Clicking on any of these "selves", i.e. profiles, will not open a new tab, but rather a whole new window. In other words, you'll start a second (or third or fourth) totally independent iteration of Chrome that runs the other "person's" email, bookmarks, apps, social media accounts--everything. It'll be as if two separate people--Teacher-You and Personal-You--are using the computer at the same time, trading off back and forth as needed. On a Mac or a Windows 10 machine, I can access and/or instantly switch between all those Chrome profiles by three-finger-swiping UP or LEFT/RIGHT. I can also use Control with a left/right arrow on a Mac... or ALT+Tab on a Windows machine to toggle back and forth. Each individual Chrome profile has its own start-up tabs, favorites, bookmarks, extensions, add-ons and themes and colors. And each one will run a wholly separate version of Drive, Calendar, YouTube and other Google Apps associated with that particular email address. Now that you know what Chrome profiles are and how easily they can help keep you organized, stay tuned for a video tutorial on how to create and manage them! This is very helpful. I will share with my colleagues. Thanks for posting! Thanks, Tom. A video how-to for setting up the profiles is forthcoming this week as well.